It looks like a very comfy hiding place! soooo sweet. our little Lily has been a "quilter cat" since kittenhood. she loves being warm and is always on or under a blanket or comforter - so sweet. As snug as the proverbial 'bug in a rug'. So sweet. I can't imagine life without our furry kids. She looks like she has settled right into home. Our Girls do that. I love it! McGuffy - Me too! I wish I could join her right now . . .
kitty's hiding really well there! Love when cats hide themselves! 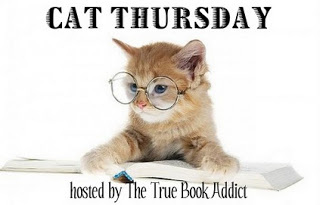 Thanks for stopping by my Cat Thursday post! Kimberly - They can hide in the smallest of places too! I'm always amazed when I find the cats under my bed. The way the frame is, you'd think nothing could fit under there. Megan - My dog was like that too. :-) The other night we were looking all over the house for my cat Parker. We finally found him underneath the blanket that we'd been using as throw on a chair. It'd been tightly tucked into the edges of the armchair, but he still managed to find a way in. Ahhh, that is too cute! Marty - We have the best cats! Serena - I wish I'd gotten a photo of her last night. She was curled up in my husband's afghan.